Cinema Tycoon 2: Movie Mania Game Review - Download and Play Free Version! Tutorial as well as in-game hints are helpful and add to your success. 3 camera views along with great graphics make watching each day interactive and enjoyable. Daily News Reel is funny and wittily references pop-culture. The large amount of upgrades will give you a sense of accomplishment while also building your profits. The game's level system makes it so theaters you build on one level do not carry over to the next. Not having multiple difficulty levels might make the game easy for some. Make the Premier Cinema in Town! 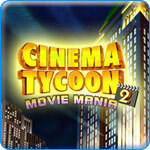 Take the reins in Cinema Tycoon 2: Movie Mania as you turn the local Cineplex into a 5-star theater. Help Mr. Pickwick rebuild his ailing theater chain and take on the remorseless mega-conglomerates. Meet Mr. Pickwick's goals for each assigned theater, which range from rundown claptraps to slick suburban multiplexes. You'll have to tap into the vibe of each town because every locale has varying types of customers and general temperaments. 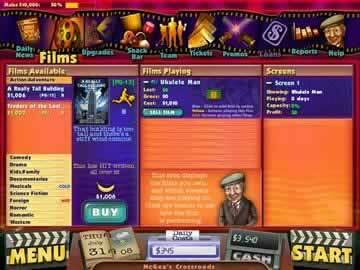 Cinema Tycoon 2: Movie Mania seems like many other money-managing challenges out there, with an array of menu screens, pull tabs, and balance sheets. However, the beauty of the game is how shockingly simple this data is presented. Rather than becoming overwhelmed with details, the game offers graphical feedback in the form of colored meters, smiley faces, and animated sequences with miniaturized patrons. Even novices can quickly see the direct connection between their actions and the resulting consequences. With a streamlined setup and a depth of game play, Cinema Tycoon 2: Movie Mania delivers on its promise of blockbuster entertainment. Find hours of play as you upgrade the theaters with valet parking, arcades, and tasty new snacks. If you like business simulations, then download Cinema Tycoon 2: Movie Mania today and see if you have what it takes to be a Cinema Tycoon! If simulation games are your thing, then you won't find something much better than this witty movie theater tycoon game that has you managing local movie houses. Cinema Tycoon 2: Movie Mania is a new game that places you in control of movie theaters, making decisions regarding personnel, inventory and most importantly, choosing the best film. The pop-culture references and hilarious movie titles along with the easy gameplay make this a great game. The new age of mega theaters has hurt independent movie houses. As manager you will have to help Mr. Pickwick, whose business is suffering because of the bigger movie complexes, rebuild his rundown yet characterful movie theaters. The theaters you will help save vary in location, the type of customers they draw, and style. You will need to recognize these differences and rebuild the theaters accordingly. Upgrading your buildings is often the best way to revitalize business. In the upgrade tab you can choose to add items to your snack bar, install bigger and better projectors, increase the number of seats in each auditorium, or add screens among other things. These increases vary in price and are all designed to generate businesses. Other options you have that may help you salvage the rundown theaters are getting loans, running promotions, and most importantly selecting the right films. 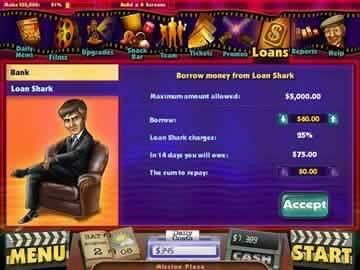 Like in other tycoon games, Cinema Tycoon 2 gives you the option of taking loans out from either the bank or a loan shark. This can be risky, but the quick cash might save your business or increase your revenue exponentially. Promotions are also a great way to get people into your theater and turn a profit. You can send out fliers, place an add in the paper, go on the radio, or have commercials on TV. Movie selection is quite possibly the best way to fill the seats. If you run movies that are “hot” your profits will grow rapidly. In addition to being one of the top money making strategies, selecting movies is one of the best elements of the game, due to the comical titles and funny movie descriptions. You might select Onion Breath, the story about a man trying to find love, while only eating onions. Or A Really Tall Building, the action/adventure movie whose tag line reads, “That building is too tall and there's a stiff wind coming.” These humorous titles and descriptions lighten the game and make playing more enjoyable. Humor can also be seen in the Daily News Reel. This is the morning tabloid that gives you pointers for the coming day, along with provide you with trashy celebrity gossip. You might find out that “Kimmie Carcrashian” and “London Hyatt” got into a fight over who has the shortest skirt, while simultaneously learning your snack bar is out of popcorn. Another headline from the reel tells of an actor charged with assault over the weekend for beating a mime with a pool cue. This is pointless and doesn't help with building a theater, yet it adds so much to the game. As far as drawbacks are concerned this game has a few minor ones. One annoyance is the level system that doesn't allow you to carry your theaters over. You might build a great theater in level 2, but in level 3 you will be starting fresh, regardless of how well you were doing. Naturally you will get slightly attached to your movie theaters, so losing them after only a short bit can be annoying. Another small drawback of the game is only having 1 difficulty setting. This may be limiting if you find the game too easy or too hard. Multiple difficulties are always a good addition to simulation games, so Cinema Tycoon 2 would be better with this option. Overall, Cinema Tycoon 2: Movie Mania is a great game that will keep you interested. The game is full of options to make your businesses successful, yet the game play is simple and easy to learn and figure out. The humorous movie titles and news reel comments along with the fun you will experience while playing, more than make up for the lack of difficulties and level system. If you are looking for a fun game that will keep you laughing and entertained this is for you. Cinema Tycoon 2: Movie Mania is a good buy. See some of the menus, options, and customer's reactions as they move through your theater in this management title.